“I AM SO STRESSED!!!!!!!! !” When stress accumulates (and it does—all stress is cumulative—work, relationship, training loads), how do you continue to live TOWARD your best self, and how you want to feel? Even good stress is hard on us if we do not manage it wisely. When I work with clients who are ready to transform their bodies (lose weight, gain strength, lose body fat, develop lasting eating habits) we always have to find a way to manage stress. Stress is part of life. So many things that come your way, everyday, that you did not actively choose; it becomes more important to make decisions about what you can choose. There is not always a relationship between effort and outcome. Control everything that you CAN control—e.g. Sleep, what you eat and drink, your attitude, training, what you watch, what you say, who you hang out with, how much you work, etc. Let go of anything you CANNOT control—e.g traffic, weather, other people, etc. It’s a process. Part of the process of managing stress is being choiceful. If I do not choose what is acceptable to me, then I accept whatever comes. Seems a haphazard way to live, yet so many people live that way. Here is an example of stress and how it impacts me; I am getting ready to depart on a two week trip to Italy with my father, who is about to turn 79-years-old, and has Parkinson’s disease. (If you haven’t experienced that type of stress, I am genuinely happy for you.) We are going to visit family, and he has couched this trip as the last time he will go to Italy, where he was born and raised, and where all of his family lives (besides my mom, my sister and myself). If you know me, you have already heard many of my concerns regarding this trip. When you own your business, there are not paid vacations. It’s a financial hit for me to leave my business (working on getting employees—easier said than done). I workout 5-6 days a week getting ready to compete, in an arena I have never wholeheartedly competed in, and one which challenges me in ways I have never known (I love this, btw!). I will not have access to any kind of equipment that I usually use for 2 weeks. AND, I DO NOT eat grains, dairy, cheese (I know that is dairy…just sayin’), fruit, night shade vegetables (as in tomatoes, eggplant) or sugar of any kind. So I am seriously in trouble, right?! I know my values. I know what it feels like when I eat off my plan, and it feels horrible! Will I ALWAYS be in control of my food on this trip? No. My family, who are all amazing chefs, will cook for my dad and me, and I will eat bits of things that are not part of my plan, because that is part of feeling Italian love. I will eat minimal amounts of things that do not make me feel good. I can recover from that. Especially because I will do on-the-road training that I can do anywhere (burpees is translated as burpess in every language across the globe! I love universal exercises!). I am renting a bike and will ride as much as possible. I am taking running shoes for intervals and walking, and a jump rope to practice double unders. I will meditate everyday. I can do a walking meditation or a sitting meditation. I use the app 10% Happier, and I love the choices I have with that app. Meditation allows me to breath into what I believe. Meditation is a gift of time for sitting with my thoughts. Lastly being out of my business for 2 weeks is probably not the worst thing for me given that I was blessed with a jam packed summer training some of the most amazing athletes… and everyone can use a break from me. I’ve also planned a week long adventure with my coach three weeks after I return. I will be in Arizona training with @coachlyons1 in October. There will be fairly strict adherence to my eating plan (although she promised me some good coffee and great wine!) and the training will be intense. I am choosing to let go what I can’t change and I am making plans to make sure I live TOWARD what feels great to me, and toward what aligns with my values of eating clean, so I can sleep like a baby and train insane. Not to mention opportunities to hang out with my one and only father in Italy can be fairly remarkable, and there are certain opportunities worth sacrifice. 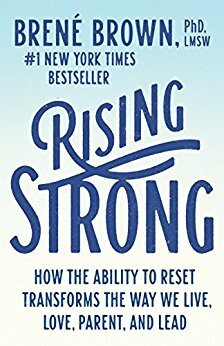 I find a lot of inspiration in Brene Brown’s book, Rising Strong. Show up for yourself, for the life YOU choose. Set your goals and know your values. Become vulnerable to the process of change. You do not always end up where you intended, but the process is worth it all.